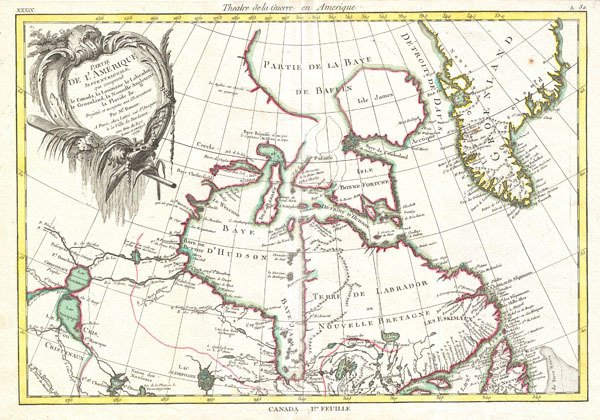 Partie De L'Amerique septentrionale, qui comprend le Canada, La Louisiane, Le Labrador, Le Greenland, La Nouvelle Angleterre, La Floride & C.
This is an important map of the Hudson Bay and the surrounding areas issued in 1776 by the French cartographer Rigobert Bonne. Covers much of what is today northeastern Canada from Lake Winnipeg to Greenland including all of Hudson Bay. This region was a hotbed of exploration throughout the 18th century. French and English concerns in the New World were desperate for access to the Pacific and the rich Asian markets. These markets had long been dominated by the Spanish who had easy access to the Pacific via Mexico and South America. The French and English set their hopes on a Northwest Passage. By the late 18th century the search for a route through the high Arctic had long been abandoned. Instead, explorers and theoretical cartographers believed that a water route might be found among the elaborate network of lakes and rivers that meandered through central Canada. Our map shows evidence of some of this exploration, particularly the travels of the Quebec born Pierre de La Verendrye and his sons around Lake Nipigon (Lac Alimipigon), the Lake of the Woods (Lac des Bois), and Lake Winnipeg (Lac Ouinipigon and Lac Bourbon). The British were equally active further north. A red dotted line encircles the Hudson Bay indicating the lands claimed by the Hudson Bay Company. In the southern part of Baffin Bay there is a note in French reading (in transliteration) that the 'English search for a passage here.' This refers to the De Fonte legend of a northwest passage. De Fonte was a 17th century Spanish navigator who, the tale goes, discovered a Northwest Passage by sailing up the Pacific Coast. Originally navigators sought the eastern entrada into the De Fonte channels in the Hudson Bay, but failing to find it, moved their searches further north into Baffin Bay - as hinted here. Bonne never gave the De Fonte legend significant credence though he clearly felt compelled to at least mention it on this map. Our map additionally names various American Indian nations throughout as well as French and English forts throughout. There are also a number of notations regarding various explorations in the Hudson Bay, the Arctic, and on land. Bonne also issued a slightly earlier edition of this map in 1771 joined to an associated map of what is today the Eastern United States. Drawn by R. Bonne in 1762 for issue as plate no. A 32 in Jean Lattre's 1775 issue of the Atlas Moderne. Rumsey 2612.071. Kershaw, Kenneth A., Early Printed Maps of Canada, 475. Phillips (Atlases) 664. National Maritime Museum, 215. British Library, World, col. 384-385 (1762-1785 eds. ).